Once little more than a misunderstood niche franchise, From Software’s Dark Souls and Bloodborne games have birthed an entire subgenre of action-RPGs. It is now clearly understood that Souls-like games include brutal, unforgiving combat, careful management of health and stamina and a very specific type of co-operative or PvP play. Dozens of games like Nioh and The Surge have mined, mimicked or mangled the From design philosophy but often added little more than minor variations. Now, From Software has released Sekiro: Shadows Die Twice, which paradoxically manages to be both very much a recognizable product of the lineage and equally, surprisingly different. No one will mistake this for another Souls game, but From Software’s thumbprints are all over it. “Sekiro” means one-armed wolf, a reference to the player character, who is a shinobi in 16th century Japan. In a major departure from the franchise, Sekiro has a focused and less opaque narrative, populated by a cast of NPCs with generally interesting stories, insights and quests. While there are magical and fantastical elements throughout the game, there is also a grounded sense of historical, cultural reality. Playable in both Japanese with English subtitles or fully and competently voiced in English, Sekiro has one of From’s most coherent and well-crafted stories, complete with multiple endings to reward repeated playthroughs. Still, there are plenty of shadowy secrets to discover that are not explicit in the dialog. It is another paradox that while Sekiro was obviously made for fans of designer Miyazaki and the Soulsborne games, the very same player will probably struggle with the new game’s combat. Gone are most of the mechanics that even expert Souls players have come to rely on, from the rhythm and style of combat to the ability to create specific builds guaranteed to wreck even the most powerful bosses. There are no classes, stats to level or armor and weapon sets to collect. Being exclusively single-player experience, there are no fellow humans to invade or to call on when hitting a wall. Playing Sekiro reminds us of the learning curve introduced by Demon’s Souls, and it can be humbling. Instead, there is one primary bladed weapon, a katana, and a prosthetic arm with all manner of attachments and upgrades, plus consumables and a suite of elegant moves to learn that can help counter the specific weaknesses of enemies. Essentially, combat hinges on an understanding of the new posture mechanic and the ability to deflect (which lowers an enemy’s posture) and counter, setting up a death blow when a foe’s heath and posture are depleted. For many players, learning this elegant new system will mean hours of un-doing Dark Souls generated muscle memory. And quite honestly, some of those hours may be frustrating. Add to this that, while players may resurrect one time in battle, each death spreads Dragonrot to the world’s NPCs, which although curable, limits the ability to access certain quests. Sekiro can feel punishing on several levels. Although the game does a better job than any prior From title in explaining its systems, there is much to discover by trial and error and watching skilled players. Sekiro is populated by a variety of imposing bosses and dozens of mini-bosses that are almost always formidable challenges. Like in all Soulsborne games, even low level enemies can ruin the player’s day if they’re not carefully dispatched. Luckily, the new grappling hook prosthetic — and the ability to approach encounters using stealth — means that traversing Sekiro’s beautifully rendered environments has a new, exhilarating freedom of movement. While the game lacks the some of the jaw-dropping and riotously colored vistas of games like God of War, Sekiro is no doubt From Software’s best looking game. Its musical score manages to avoid cliche orchestral chest-beating while creating drama in battle and is often delicate and intimate. Sekiro is From Software’s purest distillation of a game design philosophy that values skill-based combat and isn’t afraid to challenge the player at nearly every moment. Eschewing big weapons, flashy magic and “jolly co-operation,” Sekiro is squarely focused on timing and the sometimes imperceptible progression towards mastery. While the EpicNameBros of the world make it look like a casual cakewalk, mere mortals may find fun taking leave of the battlefield, to be replaced by grit and dogged determination. 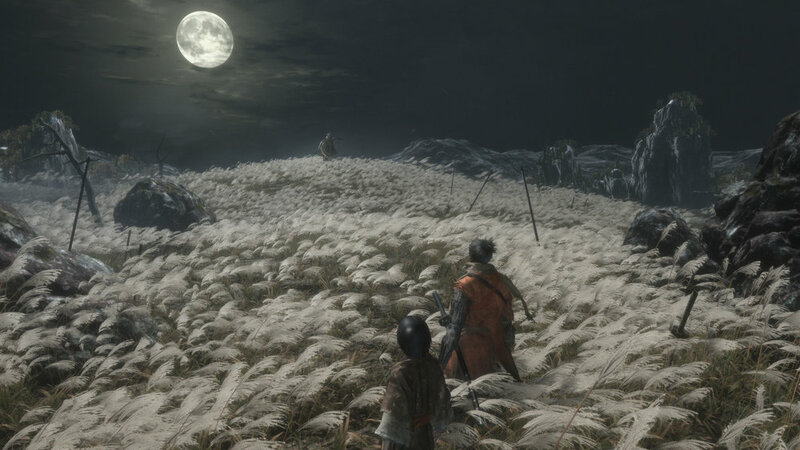 Sekiro manages the twin accomplishment of both maintaining the core gameplay that was birthed by Demon’s Souls, while making its most radical departure from the formula yet. Having spent over a thousand hours playing Dark Souls on the PC - and dozens of hours on the original console versions - it would be fair to say I have a special relationship to the game. Dark Souls is my Mario and Zelda all rolled into one, a transformative experience that at this point in my life has become more ritual than entertainment, a series of moments and tasks that produce a Zen-like state of mind. Dead Cells is like an unholy hybrid of The Binding of Isaac and Dark Souls, with the skill-based combat of the latter merged with the unforgiving structure of the former. As much as Dead Cells tries - and largely succeeds - to make some concessions to wider accessibility, it is still a game for players with patience and tolerance. Coming at the end of a very impressive gaming year, Let It Die can't help but suffer in comparison to a whole bunch of other, more burnished titles. Still, the game's excellent action combat, weirdness, and variety of weapons give it just enough character to stand out and make it worthy of attention. The pay-to-win aspect is a bummer, and there is overall a sense of things being not quite solid, but anyone who's enjoyed other Grasshopper Manufacture games will enjoy this one as well.